John Kenneth Muir's Reflections on Cult Movies and Classic TV: Breakaway 2018: "Breakaway"
In “Breakaway,” the time is September 9, 1999, and John Koenig (Martin Landau) is ratified Commander of Moonbase Alpha. A distant planet, Meta, is within reach of Earth’s space program, and has begun transmitting a signal that suggests intelligent life exists there. Meanwhile, the International Lunar Finance Committee plans to meet on September 15th, and the Meta Probe must launch during a narrow time window or backing for the project -- and perhaps for all space projects -- could be cut back, or rescinded. Complicating Koenig’s crucial task of launching the Meta Probe is the fact that the probe’s crew members -- astronauts Frank Warren and Eric Sparkman -- have contracted a mysterious “virus-infection,” just like nine others on Moonbase Alpha. However, after replacing outgoing Commander Gorski (Philip Madoc), Koenig learns from his old friend, Professor Victor Bergman (Barry Morse), that there is no virus-infection. Instead, Doctor Helena Russell (Barbara Bain) believes that the affected personnel are suffering from brain-damage caused by radiation. The only problem is that no abnormal radiation levels have been detected anywhere on the lunar surface, not even in the vicinity of the nuclear waste dumps, Areas 1 and 2. Koenig questions Dr. Russell about the Meta Probes back-up crew, and wonders if they might fall ill on their long journey, suffering from the same baffling condition. He also meets with Captain Alan Carter (Nick Tate) to find out if the probe itself is ready to go. 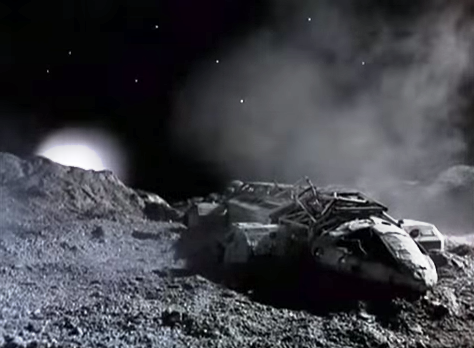 Before long, Koenig and his team determine that the lunar dumps are evidencing signs of fluctuating “magnetic surge.” The brain damage Russell has noted in the Meta Probe astronauts could be the cumulative effect of the magnetic radiation, but still, there are larger problems to contend with. 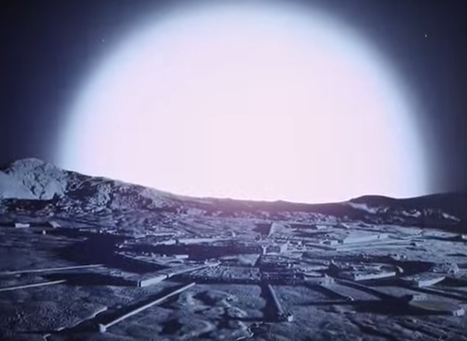 After Nuclear Waste Disposal Area One burns itself out in a surge of magnetic energy, Koenig realizes that Area Two could follow suit, causing a catastrophic explosion on the moon. 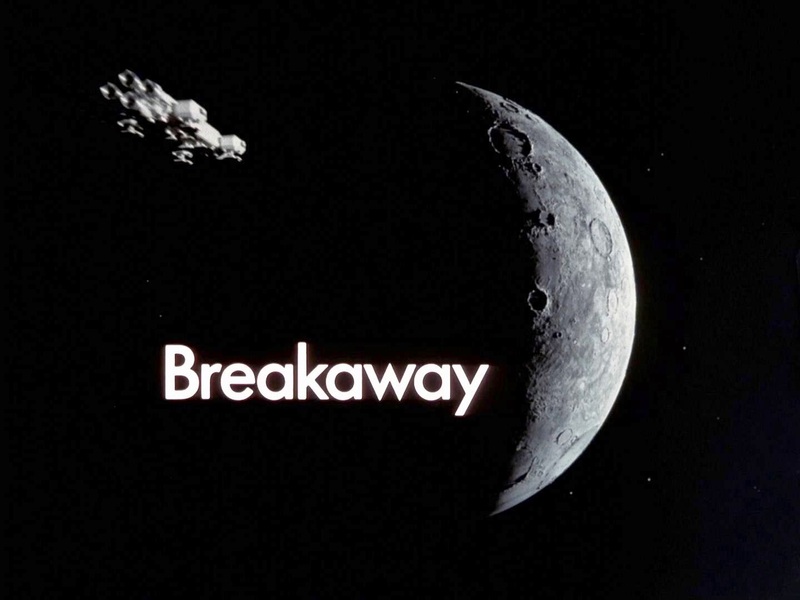 “Breakaway” -- the hour-long premiere episode of Space: 1999 (1975 – 1977) by author George Bellak -- is designed to establish the series’ (much-criticized…) premise: that the Earth’s moon, along with the 311 inhabitants of Moonbase Alpha, is blasted out of Earth orbit and into deep space on an unplanned journey of awe and mystery. When I watched “Breakaway” again for this review, however, I also detected something else of interest. 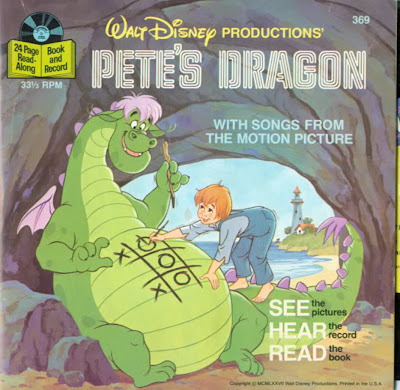 Specifically, the episode’s creators (including Gerry and Sylvia Anderson, Bellak, Brian Johnson and Keith Wilson) go to tremendous lengths to establish here a believable, realistic or recognizable near-future world, one that eschews any sense of glamour that one might associate with space travel. This is an important notion, especially since the yardstick used to rate (and often bludgeon) Space: 1999 is in fact, Star Trek (1966 – 1969), a romantic, idealistic, optimistic even glamorous vision of man’s distant future. As “Breakaway” takes pains to establish, Space: 1999 involves a different kind of world, one very much in keeping with the series’ 1970s context. Star Trek arrived not long after the Age of Camelot, in the colorful, swinging sixties. The world was our oyster. By contrast, Space: 1999 was created in the early 1970s (following 2001: A Space Odyssey) while the U.S. was mired in political scandal (Watergate) and losing a war in Vietnam. I love and admire Star Trek, obviously, but Space: 1999 thus seems a more sober genre effort, and one that deals in mankind’s real, often-conflicted nature. For example, the series eschews imperialism or gunboat diplomacy, having seen, explicitly, its failure in Eurasia. 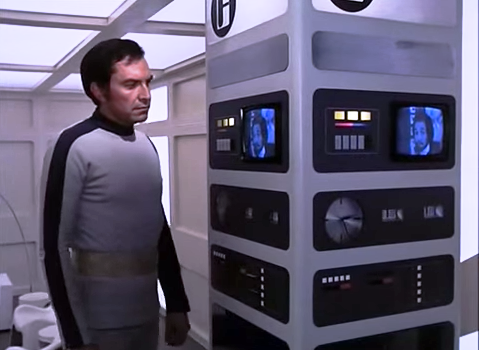 Space: 1999 also offers, in episodes like “Breakaway” a pointed critique of bureaucracy and politics. Specifically, the episode follows John Koenig as he is appointed Commander of Moonbase Alpha. At first glance, this appointment would seem very much like an honor or privilege, but as the episode progresses, one can detect how Koenig is actually being set-up by Simmonds as the fall guy, in the event that things go wrong. For example, Simmonds has withheld crucial information from Commander Koenig, and not permitted Dr. Helena Russell to report her findings about the so-called “virus-infection,” which is actually brain damage caused by exposure to an unknown form of radiation. The virus-infection” is so insidious a lie or cover story because Koenig has been led to believe that there is the possibility of the astronaut’s getting better. No doubt he accepted command of Alpha with that idea in mind. Koenig is soon faced with the reality, however, that here is no getting better or healing from catastrophic brain damage and genetic mutation (as established by Alpha’s computer). One beautifully-orchestrated shot in “Breakaway” reveals the distance between Russell and Koenig, and their knowledge, at least at first. In the foreground, we see a dying astronaut, his weakening form taking up considerable space in the frame. 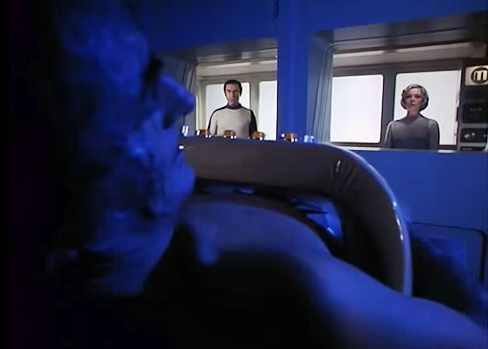 In the background of the shot, we see Koenig and Russell framed in separate windows, worlds apart visually-speaking, as they countenance what his death really means. Russell knows the truth, and what the astronaut is facing. Koenig, by contrast, is playing catch-up, and forced to re-examine the facts that he has been provided. Koenig’s position as “fall guy” is also established by another character, Commander Gorski. Koenig notes that Gorski seems to be handling “his suspension” from command of Moonbase Alpha rather well. Koenig also observes to Victor that Gorski is famous for being “flexible,” a coded-commentary on his propensity to switch allegiance and sides, depending on which way the wind blows. Why is Gorski so friendly and helpful? It could be because Koenig’s appointment as commander absolves the former commander of all responsibility or guilt in the matter of the dead astronauts and the failure of the Meta Probe. It is Koenig’s neck that is on the chopping block, not his. And consider too, Koenig’s terminology vis-à-vis the ex-commander. He declares that Gorski is taking his “suspension” well. The word suspension explicitly suggests a temporary status. Is it possible that Simmonds has made Koenig commander only to see him fail, and plans to restore Gorski (a more flexible puppet…) to the same post after Koenig’s failure? No wonder Gorski seems unbothered! He’s Simmonds’ man, and has been taken off the hook. He’ll just wait in the wings until Koenig is blamed for the situation…. “Breakaway” is structured in such a way that Koenig, learns, a piece at a time, how he has been manipulated, and a trap has been sprung (by Simmonds) and the actual science behind the so-called "virus infection." The severity of the crisis, in fact, sort of creeps up on him, another idea reflected in the episode's visuals. The danger is looming, but he is not entirely aware of just how bad it is. Koenig has been sent to the Moon to get “the space flight of the century” launched. Everything -- but notably future-funding from the International Lunar Finance Committee – depends on the success of the mission. But when he arrives at Alpha, Koenig learns that crucial information has been denied him and there is, in essence, no way to get the Meta Probe launched. He recognizes that he is Simmonds’ fall guy. Angry, Koenig confronts Simmonds and tells him, point-blank, that Simmonds “lied” to him. Simmonds attempts to cow him at first, telling him that he will replace Doctor Russell with a team of “top medical people,” no doubt “yes men” who will hew to the cover story of a virus infection. Quite rightly, Koenig demurs, and rejects the offer. At that point, fully cognizant of the situation, Koenig begins horse-trading, as I noted above, granting concessions only in return for them. This is, Koenig understands, the only way to get to the bottom of the situation, and to understand the nature of the crisis unfolding around him. Koenig also makes the decision of a good leader. He knowingly and irrevocably takes his own success off the table, and focuses on the problem. “Forget the probe,” he tells Carter. The space-flight of the century is off, he decides, until he gets the answers he needs. This is a courageous stand, and one that separates Koenig from men like Simmonds, or Gorski. Ultimately, it matters more to him that people are dying than that the finance committee is meeting in a few days. Again, just make the comparison crystal clear, in franchises such as Star Trek or Star Wars, or even Doctor Who, there tends to be very little if any discussion about the “cost” of space adventuring. Artistically-speaking, as soon as you get into the realm of budget and financing, and CYA political maneuvering, one thing has happened: the realm of outer space has become de-romanticized. It has become, essentially, an extension of the (failed?) systems we see playing out here on Earth. 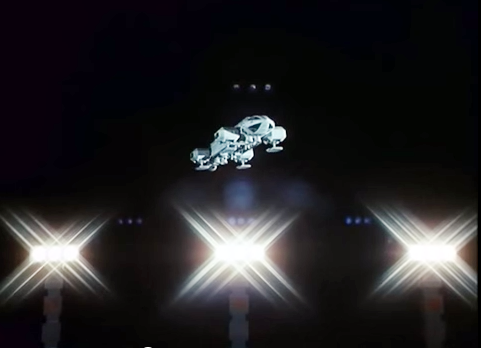 Importantly, a close-up look at this world is the starting point of Space: 1999. When the Moon is blown out of orbit, it is leaving behind a “failed” society in a sense, and mankind – represented by good men like Koenig -- gets a second chance to write his destiny. Other aspects of “Breakaway” also seek to de-romanticize or de-glamorize the series’ milieu. Once more, this line is a deliberate rebuke of the popular space opera form, which suggests that when man is capable of reaching the stars, he will no longer have to worry about money, or poverty, or even political-backstabbing. 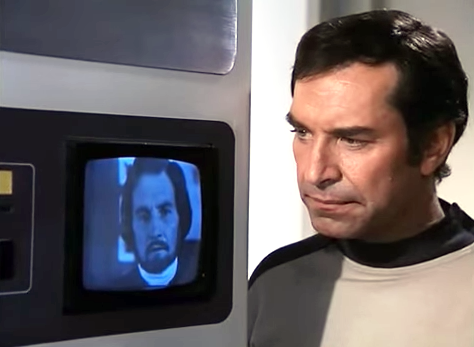 Space: 1999 suggests instead that man will remain man, and that he will takes his nature to the stars, with all the drawbacks that description (and his psychology) suggests. It may be more apt, at this juncture to describe Space:1999 as the rebirth of man, since many episodes of the series reckon with the Alphans facing different realms of existence, and considering their place and purpose in the universe. Many episodes of the series also pit the Alphans -- as examples of restored humanity -- against more advanced civilizations that, like Earth and men like Simmonds, seem to emerge from dystopian or sterile states. These worlds and peoples are examples from the Alphans to learn from; examples of a road that they need not take on their exodus to the stars, on their new beginning. 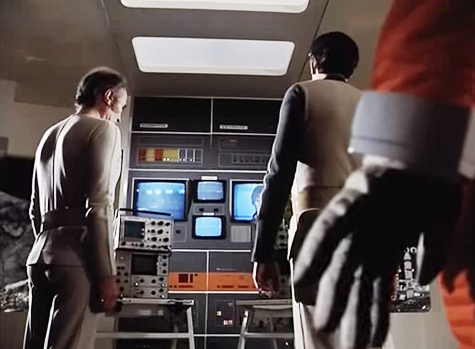 It is so ironic that Space: 1999 is often criticized for an “unrealistic premise” when the ingenious approach to storytelling, characterization, and production design is, in some sense, actually the opposite. It is hyper-realistic. “Breakaway” is our starting point. It portrays a world we recognize as an extension of our own, in which bureaucrats still practice CYA, and in which the failure to solve big problems (like atomic waste) leads to bigger problems down the road. It is the world, finally, that the Alphans must “break away” from if man is to have a future of hope and purpose. 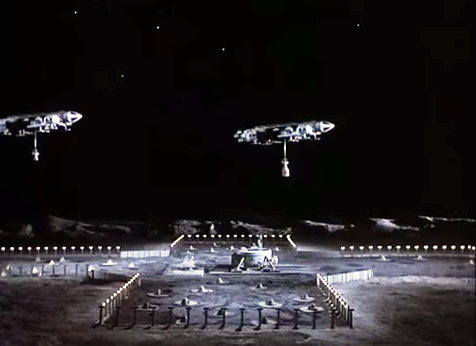 SPACE:1999 season one is art. The show's first season still stands, for me, as a powerful achievement in television science fiction. If only it continued in that vein.